American earth magnetosphere satellite. Wind was designed to provide continuous measurement of the solar wind, particularly charged particles and magnetic field data. Scientific satellite built by Lockheed Martin Astro for NASA, USA. Launched 1994. Status: Operational 1994. First Launch: 1994-11-01. Last Launch: 1994-11-01. Number: 1 . Gross mass: 1,195 kg (2,634 lb). Height: 2.00 m (6.50 ft). This data wind will help determine how the solar wind affects magnetospheric and ionospheric behavior. Wind, and its sister spacecraft Polar, were NASA's contribution to the International Solar Terrestrial Program (ISTP), an international effort to quantify the effects of solar energy on the Earth's magnetic field. 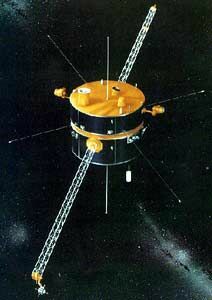 The specific objectives of Wind were to: (1) provide complete plasma, energetic particle, and magnetic field input for magnetospheric and ionospheric studies; (2) determine the magnetospheric output to interplanetary space in the upstream region; (3) investigate basic plasma processes occurring in the near-Earth solar wind; and (4) provide baseline ecliptic plane observations to be used in heliospheric studies. The satellite carried the first Russian instrument to fly on a US spacecraft since cooperation resumed in 1987. EPACT (Energetic Particle Acceleration, Composition and Transport) telescope suite - designed to provide a comprehensive study of energetic particle acceleration and transport processes in solar flares, the interplanetary medium, planetary magnetospheres, and galactic cosmic rays. Magnetic Field Investigation (MFI) magnetometers - investigated the large-scale structure and fluctuation characteristics of the interplanetary magnetic field as a function of time. Seven measurement ranges: plus or minus 16, 64, 256, 1024, 4096, 16,384, and 65,536 nT with resolution up to 2.5E-4 to 1 nT. Radio and Plasma Wave Experiment (WAVES) - measured the intensity and arrival direction for radio and plasma waves originating in the solar wind near the Earth. Provided by France. Solar Wind Ion Composition Spectrometer (SWICS) / Suprathermal Ion Composition Spectrometer (STICS) - designed to provide detailed measurements of the elemental and ionic-charge composition of the solar wind, measurements of the average speed, density, and temperature of solar wind 4He++, measurements of the average speed of solar wind protons, and measurements of the energy distributions of selected ion species. Solar Wind Experiment (SWE) - a six-axis ion-electron spectrometer which provides three-dimensional velocity distribution functions for ions and electrons, with high time resolution. Transient Gamma Ray and EUV Spectrometer (TGRS) - made high-resolution observations of transient gamma-ray events in the energy range from 20 keV to 10 MeV. 3-D plasma and energetic particle analyzer (3DP) - measured the three-dimensional distribution of plasma and energetic electrons and ions with high energy, angular, and temporal resolution, over the energy range 10 eV to 5 MeV. Family: Earth, High earth orbit, Magnetosphere sat. Country: USA. Launch Vehicles: Thor, Delta, Delta 2 7000, Delta 7925-10. Launch Sites: Cape Canaveral, Cape Canaveral LC17B. Agency: NASA, Martin. Bibliography: 2, 6, 13349. 1994 November 1 - . 09:31 GMT - . Launch Site: Cape Canaveral. Launch Complex: Cape Canaveral LC17B. LV Family: Thor. Launch Vehicle: Delta 7925-10. Wind - . Mass: 1,195 kg (2,634 lb). Nation: USA. Agency: NASA Greenbelt. Class: Earth. Type: Magnetosphere satellite. Spacecraft: Wind. USAF Sat Cat: 23333 . COSPAR: 1994-071A. Apogee: 1,578,658 km (980,930 mi). Perigee: 48,840 km (30,340 mi). Inclination: 19.65 deg. Period: 318,240.00 min. Solar wind research in L-1 halo orbit; part of International Solar Terrestrial Physics program. 221 day orbit. NASA's Wind probe made its 32nd lunar flyby on August 19, 2000, with a closest approach of 7600 km to the surface. This placed it on a 2 million km apogee orbit, adjusted on August 26 to an approximately 567000 x 1620000 km x 21.8 deg `Distant Prograde Orbit', reaching apogee on September 29 2000.